Email marketing is so much more than what goes from an ESP to a recipient's inbox. There are other tools that can be put into place to enhance the effectiveness of campaigns and increase a marketer's ROI. Combining these tools to work harmoniously will have the greatest effect on your email marketing efforts. Using both the Benchmark Email Community as well as social network tools, you can achieve a greater reach and longevity with your email campaigns. You can click at the top of the Schedule Delivery page to add your newsletter to the Benchmark Email Community. It's optional, but it's a great way to obtain further reach and longevity with your email campaigns. The Benchmark Email Community is a permanent home for an email, whereas it could be deleted from an inbox. You can customize the URL, choose which category your email should be in, and tag the email with any keywords that will help it come up on a search engine. Every email sent to the Community Newsletter Archive is automatically indexed in Google. This will allow people not on your email list to find your email via Google and other search engines. 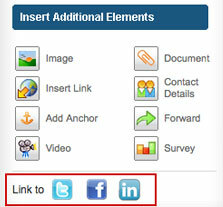 You can get feedback for your content as registered users can comment and vote for your email. This could be useful for making your future emails more effective. It will show you what was well received as well as what questions sparked discussion. On the Schedule Delivery page, you can also choose to share your message on Delicious, Digg, Reddit, Facebook, StumbleUpon, MySpace and Twitter. With social sharing buttons, an email marketer is able to reach beyond the limits of a subscriber list. Any given recipient can decide to share your newsletter with their various social networks and their fans or followers. Providing a clear and easy-to-find sign up in your newsletter is essential when using tools like the Benchmark Email Community. That way, any non-subscriber who comes across your newsletter can sign-up with ease. Not only does this help build your list, but also it is helpful for when your subscribers forward your email to a friend. Social networking integration is a two way street with the Benchmark Email Community. You can use the URL generated by the community to link your newsletter from any and all of your social networking sites. Benchmark Email also recently added buttons that will link anyone viewing your newsletter straight to your social networking pages on Facebook, Twitter and LinkedIn. The Benchmark Email Community is a tool that can be used in conjunction with social media tools to increase the reach and longevity of email campaigns. This approach will not only help to grow your email list, but also your following on social networking channels. Through the using of social sharing buttons, your campaigns will land in front of more people than just your subscribers. Having a permanent home on the web, your emails live on - even if they are deleted from inboxes. And the added bonus is that they can be found through search engines. With so many benefits, there's no reason not to take advantage of the Benchmark Email Community. Glad you're getting use of the Community Carmen! Stay tuned to the Benchmark Email Blog. I just submitted a post about best practices for the Benchmark Email Community.